Filming of the fifth season of House Husbands begins in Melbourne this week, with new cast members Hugh Sheridan, Roy Billing and Nanyce Hayes. Sheridan plays music teacher Nick Gazecki, who makes an enemy of his new neighbour Lewis (Gary Sweet). Roy Billing and Nancye Hayes will play Mark’s (Rhys Muldoon) parents. Returning cast include Gary Sweet (Lewis) Firass Dirani (Justin), Rhys Muldoon (Mark), Julia Morris (Gemma), Natalie Saleeba (Abi), Jane Allsop (Rachel), Louise Siversen (Miss Looby) and Denise Scott (Nurse Toni). Gyton Grantley is not returning. 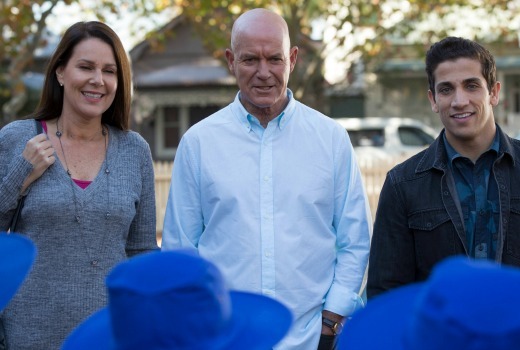 House Husbands is a Playmaker production for the Nine Network, with the support of Film Victoria. Executive Producers are Andy Ryan and Jo Rooney from the Nine Network, with David Maher, David Taylor and Sue Seeary from Playmaker. The series is produced by Sue Seeary, with script producer Jo Martino and directors Grant Brown, Ian Watson, Fiona Banks and Sian Davies. I see the article lists the returning actors and makes no mention of the kids. They are the shows point of difference and need more storylines in my opinion. I liked Gyton on House Husbands. im shocked he not returning. whats gonna happen to his kids on the show plus isn’t Gemma carrying his child. I assume Gyton didn’t want to return! Such a shame he was the most likeable HH! Will they have another gay mainstream character and couple? Awwww no, no more Kane? I guess we won’t see how the baby turned out then (where Gemma was pregnant)? Assuming Justine Clarke is out too?? ?